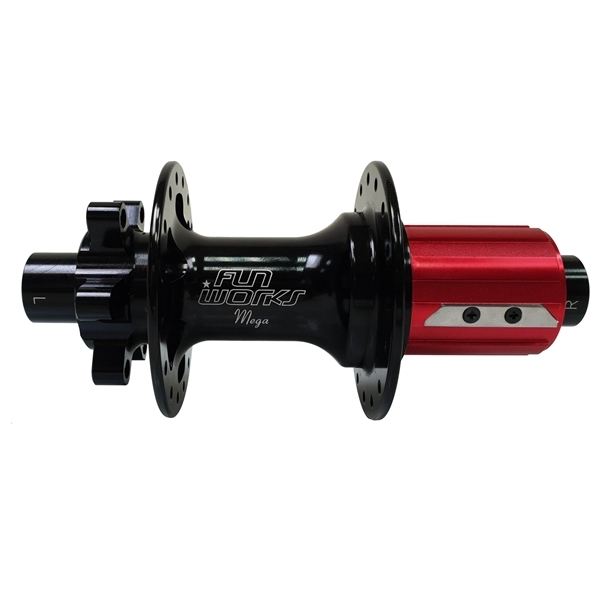 Product information "Fun Works Mega IS disc 36T Ratchet Drive Rear Hub 6-Bolt"
The Fun Works Mega the new flagship of the current Fun Works hub series comes with many great features. The freewheel technology is based on a ratchet drive made of hardened tool steel with 36 teeth which engage synchronously. This means a small pedal stroke with a more direct power transmission and a low wear of the drive.The Shimano freehub is equipped with the new Spline Protection System (SPS) which protects the freehub against bite marks of the cassette.The hub shell is forged and CNC machined for maximum durability.The angled hub flange allows the spokes to be aligned more optimally and tensioned more evenly. The double-sealed industrial bearings ensure the smooth running of the hub.LipLock Seal technology end caps effectively protect the bearings, sit stable in the hub and automatically ensure the perfect preload of the bearings (no annoying adjusting of bearing play necessary).The end caps are exchangeable as usual without special tools by simply pulling off and ensure a high compatibility for different axle systems.Shimano standard compatible freehubs will be supplied ready to take 11speed Road or MTB cassettes.A spacer for 8/9/10speed Road or MTB Cassettes and for 11speed MTB Cassettes is included to each hub. Related links to "Fun Works Mega IS disc 36T Ratchet Drive Rear Hub 6-Bolt"
Customer evaluation for "Fun Works Mega IS disc 36T Ratchet Drive Rear Hub 6-Bolt"